On 20 November sunrise at Makin came at 0612. Weather was fair. 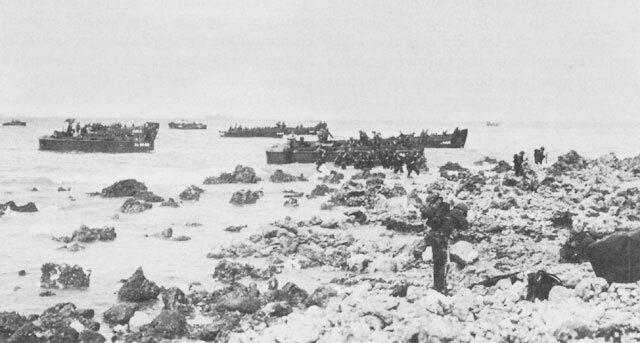 Wind was east-southeast at thirteen knots, which meant there was relatively little surf either at the main landing beaches on the west coast or inside on the protected lagoon.1 At 0603 the first of the troop-carrying transports, Leonard Wood, arrived on station in the transport area off Red Beaches on the western coast of Butaritari and commenced to lower her boats. Within four minutes the three other transports and the cargo ship carrying the 165th Regimental Combat Team had followed suit. Admiral Turner sent the signal that H Hour would be at 0830 as planned and that William Hour for the landing on Yellow Beach on the north shore of the island would tentatively be 1030, a time subsequently confirmed. At 0750 the order was given to move to the line of departure.9 The amphibian tractors formed two inverted V's, each pointed toward a beach, and one by one the other landing craft pulled off from their circles and formed a series of triangular formations constituting the subsequent landing waves. Two destroyers, Phelps and MacDonough, had taken station approximately 2,800 yards west of Red Beaches. When the first landing wave was between them, the two ships began to move slowly toward the island firing their 5-inch guns. At 0815 the first wave of amphibian tractors passed through the escorting destroyers and headed for the beach. Landings on RED Beach were hazardous because of coral rock formations. waterproofed for the landing, rolled off the ramps into water which did not quite drown them out. Ahead of them, the men struggled in swells sometimes over their heads, stumbled over rocks and slipped on boulders, or sought cover at the edge of the beach. 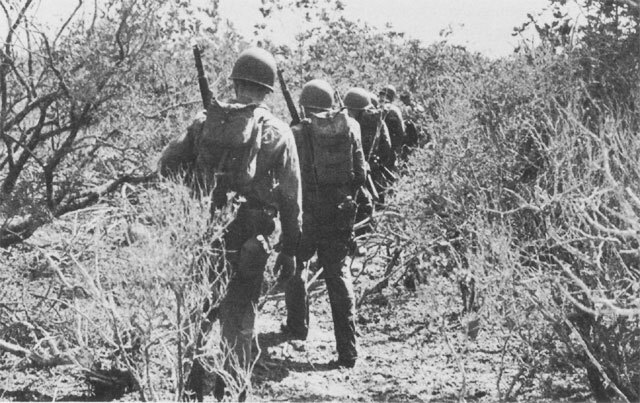 Dense Vegetation on Butaritari retards the advance of troops. Dummy Coast Defense Gun made from a coconut log. Thus within less than two and a half hours after the initial landing, the beachhead had been secured to a line 1,300 yards inland. Ukiangong Point had been occupied and preparations were already under way for making that area suitable for the establishment of artillery positions from which the main attack eastward to the tank barrier could be supported. Part of Flink Point had been secured and nothing stood in the way of securing the whole of that peninsula, which was completed, in fact, by 1240. No opposition of any consequence had yet developed. Except for the initial difficulties in getting the troops ashore against natural rather than man-made obstacles, the landing had been a pushover. Early in the morning of D Day, Admiral Turner had confirmed that William Hour for the landing on Yellow Beach would be 1030. 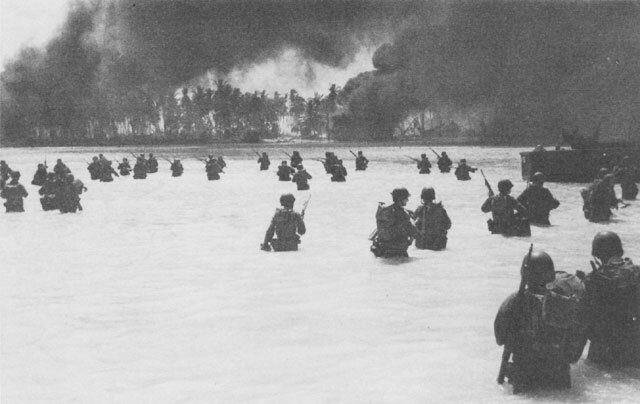 According to the plan this beach, which lay between On Chong's Wharf and King's Wharf on the northern (lagoon) shore of Butaritari, would be assaulted by the 2d Battalion Landing Team of the 165th Infantry reinforced by tanks of the 193d Tank Battalion. This force was to move the short distance across the island to the ocean shore, then branch to right and left (west and east). The group on the right would move toward the West Tank Barrier in conjunction with a simultaneous push from the other side of that barrier by the 1st Battalion Landing Team. The group on the left would establish positions west of the East Tank Barrier and hold there pending the reduction of the West Tank Barrier and the capture of the entire "Citadel" area including the village of Butaritari. The troops charged with assaulting Yellow Beach were carried aboard the transport Neville, the LSD Belle Grove, and the LST 179. 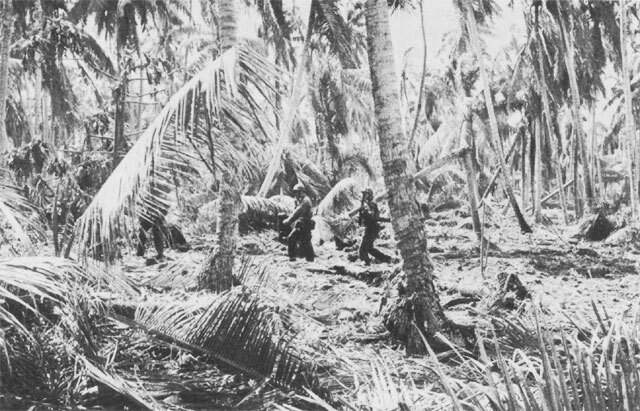 Aboard Neville were the 2d Battalion of the 165th Regiment, commanded by Lt. Col. John F. McDonough, and the reconnaissance platoon that was scheduled for tiny Kotabu Island just north of Flink Point. Belle Grove carried the tanks of Company A, 193d Tank Battalion, boated in LCM's. Embarked on LST 179 was Detachment Z of the 105th Infantry loaded in the sixteen LVT's that would make up the initial assault wave. YELLOW Beach Landing Area. 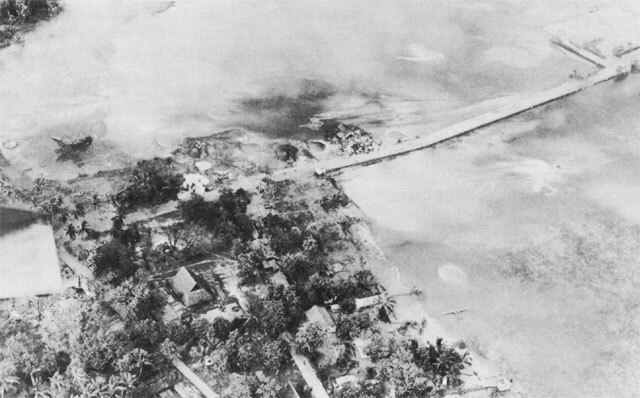 Landing craft head for the beach under the smoke of the preinvasion bombardment (above); King's Wharf (below). defensive beach blocks from the base of each wharf to points about 150 yards inland. King's Wharf fell without a contest, once the first troops had landed. On Chong's Wharf, although beaten to kindling wood, still offered some cover to the enemy and a force moved in to seize it at once. 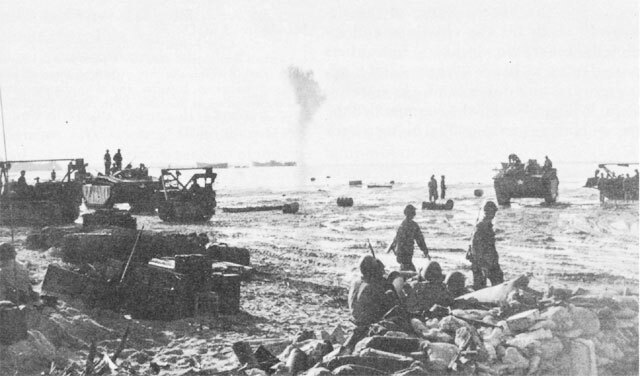 YELLOW Beach Landing of the 2d Battalion, 165th Infantry. Hulks Off On Chong's Wharf being bombed (above), while soldiers on the reef cease activities to watch (below). Meanwhile, landings of later waves on Yellow Beach had been interrupted. 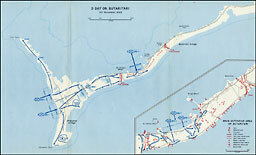 Medical aid men, who were needed ashore, and Maj. Dennis D. Claire, who was supposed to command the forces moving to the left from Yellow Beach against the East Tank Barrier, were still afloat in landing craft waiting to go in.47 In spite of the distraction caused by the hulks, the assaulting troops had penetrated the Citadel area, the most strongly fortified on the island, lying between the two tank barriers. 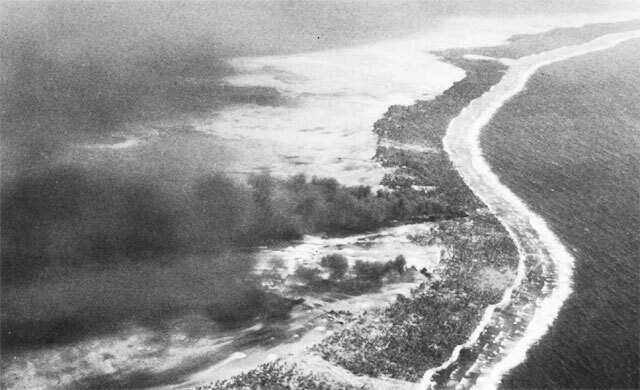 In spite of adverse hydrographic conditions and in spite of moderate fire from the shore, the first phase of the assault on Yellow Beach had been successfully completed with only minor casualties. 1. TF 54 Opn Plan A2-43, 23 Oct 43, Annex B, p. 43; Commander Central Pacific Force U.S. Pacific Fleet, War Diary, 1-30 November 1943, Annex A, p. 1. 2. Fifth Amph Force Rpt, Capture of Gilbert Islands, Annex A, pp. 14-15; V Phib Corps GALVANIC Rpt, Annex B, Rpt by G-3, pp. 1-2; 165th Infantry Regiment Combined Journal Events and Message File, 20 Nov 43, located in AGO Records Administration Center, Kansas City, Missouri. 3. 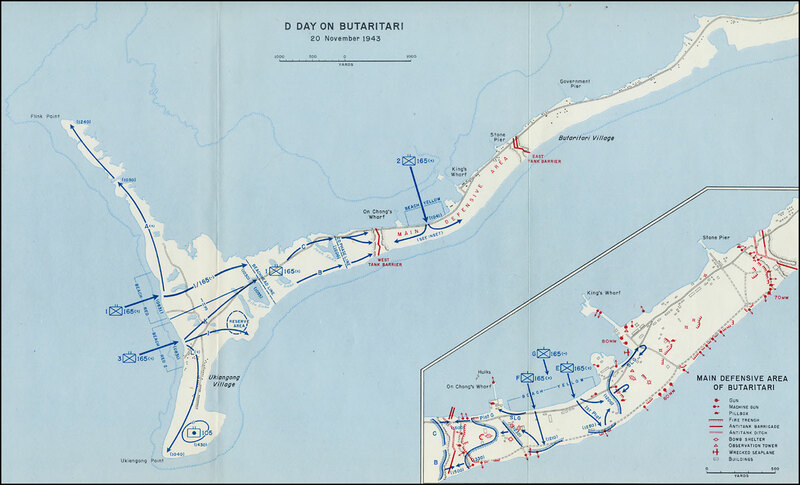 Fifth Amph Force Rpt, Capture of Gilbert Islands, Incl H, pp. 6-10; V Phib Corps GALVANIC Rpt, Incl F, Rpt by Special Staff Officers, Sec. II, Naval Gunfire Rpt, pp. 1,3. 4. Ltr, 27th Inf Div Artillery Officer (Col Harold G. Browne) to CTF 52.6, 7 Dec 43, sub: Rpt on Naval Gunfire in Makin Opn, p. 2, AG 327 Art 0.3.0 (22866), DRB AGO. 5. Fifth Amph Force Rpt, Capture of Gilbert Islands, Incl H, p. 10. 6. USS Leonard Wood Action Rpt, 20 Dec 43, p. 2; USS Calvert Action Rpt, 28 Nov 43, p. 2. 7. V Phib Corps GALVANIC Rpt, Incl C, p. 342. 8. 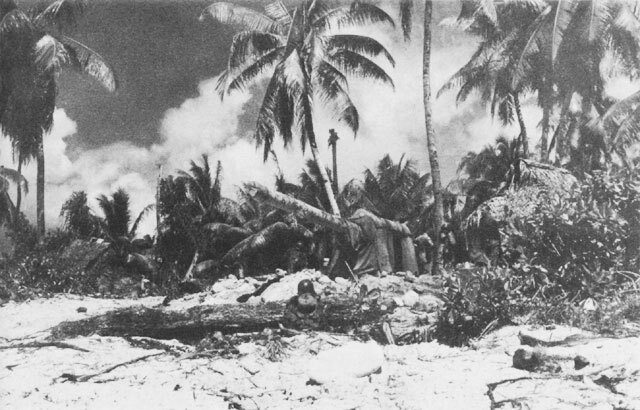 Fifth Amph Force Rpt, Capture of Gilbert Islands, Incl A, p. 15. 9. USS Leonard Wood Action Rpt, 20 Dec 43, p. 3. 10. USS Phelps Action Rpt, 20-26 Nov 43, p. 2; USS MacDonough Action Rpt, Bombardment of Makin Island, 20 Nov 43, pp. 2, 3; BLT 165-1 FO 4, 11 Nov 43, Annexes B and C.
11. 193d Tk Bn Rpt of Makin Opn, Sec. XIII, Rpt of Provisional Amph LVT Co, p. 34; Marshall, Makin Notes, p. Dl; Maj Millard C. Inskeep, Tanks in the Makin Action, and Sgt Frederick A. Baxter, Armored Force Action on Makin, MSS, OCMH. Major Inskeep was Executive Officer, 193d Tank Battalion. 12. Marshall, Makin Notes, p. D1. 13. TF 52 Amph Attack Order A3-43, 23 Oct 43, Annex I. 14. Marshall, Makin Notes, p. D1; 193d Tk Bn Rpt of Makin Opn, Sec. XIII, Rpt of Provisional Amph LVT Co.
15. 27th Inf Div G-2 Jnl, 20 Nov 43. 16. USS Leonard Wood Action Rpt, 20 Dec 43, p. 3. 17. USS Calvert Action Rpt, 28 Nov 43, pp. 2-3. 18. 27th Inf Div FO 21, 23 Oct 43. 19. 193d Tk Bn Rpt of Makin Opn, pp. 71-77; V Phib Corps GALVANIC Rpt, Incl F, Rpt by Special Staff Officers, Incl 3, Rpt of Engineer Officer, p. 3. 20. Marshall, Makin Notes, pp. B2-B4. 21. 27th Inf Div G-3 Msg File, 20 Nov 43, Msgs 26, 29, 35, 39, 40, 42. 22. Marshall, Makin Notes, 3d BLT map, after p. F3. 23. 27th Inf Div G-3 Msg File, 20 Nov 43, Msg 30, and G-2 Msg File, Msg 55. 24. JICPOA Bull 4-44, Part III, pp. 65, 73-77. 25. 27th Inf Div G-3 Msg File, 20 Nov 43, Msgs 42, 43. 27. USS Neville Action Rpt, 5 Dec 43, pp. 1-3. 28. USS Phelps Action Rpt, Seizure and Occupation of Makin Island, 5 Dec 43, p. 3. 29. Marshall, Makin Notes, p. G 1. 31. Fifth Amph Force Rpt, Capture of Gilbert Islands, Incl A, p. 16. 32. V Phib Corps GALVANIC Rpt, Incl B, G-3 Rpt, p. 3. 33. Ibid., pp. 3 4; USS Neville Action Rpt, 5 Dec 43; Interv, Capt Bernard E. Ryan, CO Co E, 165th Inf, in S.L.A. Marshall, file of intervs (hereafter cited as Marshall Intervs), p. 38, OCMH. 34. Marshall, Makin Notes, p. F37. 35. Interv, Capt William Ferns, CO Co M, 105th Inf, Marshall Intervs, p. 55. 36. Marshall, Makin Notes, pp. F36-F41. 37. Marshall, Makin Notes, p. F37. 38. Marshall, Makin Notes, p. EE2; 193d Tk Bn Rpt of Makin Opn, p. 44. 39. 193d Tk Bn Rpt of Makin Opn, p. 56. 41. Marshall, Makin Notes, p. G2. 42. Intervs, Capt Bernard E. Ryan and Capt Francis P. Leonard, CO Co F, 2d Bn 165th Inf, Marshall Intervs, pp. 38, 48. 43. USS Neville Action Rpt, 5 Dec 43, pp. 7, 8; V Phib Corps GALVANIC Rpt, Incl B, G-3 Rpt, p. 4. 44. Marshall, Makin Notes, p. F30a; V Phib Corps GALVANIC Rpt, Incl F, Rpt by Special Staff Officers, Sec. 1, Rpt by Air Officer, p. 4. 45. Fifth Amph Force Rpt, Capture of Gilbert Islands, Incl A, p. 17. 46. Interv, Capt Ferns, Marshall Intervs, p. 56. Captain Ferns states that there were two destroyers participating in this shelling. Admiral Turner's narrative of the action, however, indicates that only one, Dewey, was firing at this time. Fifth Amph Force Rpt, Capture of Gilbert Islands, Incl A, p. 17. 47. Marshall, Makin Notes, p. F30a.